The St. Andrew's XC team welcomes athletes of all levels with an emphasis on self-improvement. Members of the team learn the essentials of endurance training, nutrition, stretching, and racing. The coaches tailor each workout to the individual needs of the team members. They adjust workouts to ensure they are challenging enough to produce improvement but not so challenging as to cause injury. While it is the coaches' goal to provide students with a healthy, collegial and fun way to spend their fall, they also encourage athletes to strive for both individual and team success. During the course of the season, the varsity level and junior varsity level runners compete in dual meets as well as major invitationals, which lead up to a Conference and State Private School Championships. Over the last decade, the St. Andrew's boys' cross country team has won the league title once as well as six small school Maryland state championships. Assistant Boys' Cross Country Coach Dave Brandt attended the College of Wooster in Wooster, Ohio where he was a varsity letter winner in cross country for three years as well as a two year letter winner in both Indoor and Outdoor track. He was a conference point scorer in the indoor conference championship 3,200 meter as well as the outdoor 10,000 meter as a sophomore in 1985. Brandt was also the head cross country coach at the Hun School in Princeton, NJ between 1990 and 1992 as well as 1997-1999. 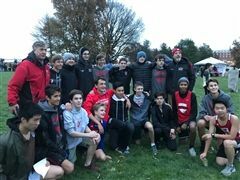 The St. Andrew’s boys’ cross country team culminated one of its finest seasons ever on Monday, November 12 by finishing second at the Small School State meet held in Westminster, Md.